Star Trek Legacy will have all you Star Trek fans creaming at the mouth as it is by far the best game from the long running television and movie series to ever be released. The team at Ubisoft have created the game with jaw dropping graphics which really do make the game that much more realistic and it also has a tremendous story line to boot. Definitely worth buying without a shadow of a doubt. 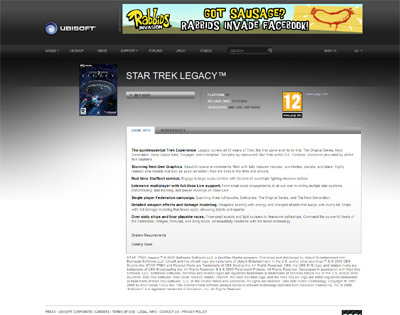 We have also compiled a Review System for this, of which Star Trek Legacy is Rated as Five Stars, the highest possible score available from the Game Review Team.